The Food and Drug Administration has responded to Freedom of Information Act (FOIA) requests for information regarding its efforts to start testing food samples for residues of glyphosate as well as some other herbicides, including 2,4-D.
As researchers we often look to documents to shed new light on issues important to food policy. Sometimes, they simply reflect what we already know. That’s the case with one new communication string that adds to evidence of a far-reaching strategy by food industry players to discredit and diminish the world’s leading cancer research agency. We’ve already seen documents from Monsanto and other chemical industry interests laying out plans to tear apart the credibility of the International Agency for Research on Cancer (IARC) because of its classification of Monsanto’s weed killer glyphosate as a probable human carcinogen. Now we see evidence that other food industry players are part of the scheme; working to head off potentially damaging IARC scrutiny of food additives such as aspartame, sucralose, and more. The email of intrigue was obtained through a state open records request. It shows communication between James Coughlin, a one-time scientist for Kraft General Foods Inc. who operates a food and “nutritional” consulting business, and Timothy Pastoor, a retired toxicologist with the agrochemical giant Syngenta AG who now runs his own “science communications” business. Also included on a portion of the email string is Monsanto PR man Jay Byrne, who runs a “reputation management” and public relations business, and Douglas Wolf, a former Environmental Protection Agency scientist now with Syngenta. In the October 2016 email, Coughlin tells Pastoor how he’s been “fighting IARC forever! !” dating back to his time at Kraft. He relates the time he spent criticizing the international cancer agency to a U.S. House of Representatives staffer who was coordinating an effort to strip U.S. funding from IARC. Glyphosate Case 0178 EPA-HQ-OPP-2009-0361 glyphosateRegReview@epa.gov (703) 347-0292. Score another point for corporate power over protection of the public. U.S. Rep Lamar Smith, chairman of the U.S. House of Representatives Committee on Science, Space, & Technology, has slated a full committee hearing for Feb. 6 with an agenda aimed squarely at attacking some of the world’s top cancer scientists. Given the fact that cancer is the second-leading cause of death in the United States, it seems obvious that our lawmakers should be supporting cancer science rather than trying to thwart it. But Smith’s action comes after the World Health Organization’s International Agency for Research on Cancer ( IARC) angered Monsanto Co. when it declared the pesticide glyphosate, a key ingredient in Monsanto’s weed killing products, to be a probable carcinogen. Though the hearing is titled “In Defense of Scientific Integrity: Examining the IARC Monograph Programme and Glyphosate Review,” the irony of the descriptor is not lost on those who have been following Smith’s efforts to derail and defund this cancer research agency. It’s worth noting that the plan to put the International Agency for Research on Cancer on the hot seat was put into motion roughly three years ago when Monsanto predicted the international cancer scientists would find its weed killer to have carcinogenic potential. The company said as much in internal communications brought to light through recent litigation. A similar false narrative pushed by the chemical industry and repeated by Smith accused IARC of deleting assessments finding no connection between glyphosate and cancer from its final report. Smith and team either don’t know or don’t care that IARC’s deletions were of Monsanto assertions that the cancer scientists said could not be substantiated. Cancer “affects almost everyone’s life, either directly or indirectly,” and beyond the toll on life and health it costs the United States more than $200 billion in medical costs and lost productivity, according to the U.S. Department of Health and Human Services (HHS). Clearly, the companies that sell chemicals linked to cancer prefer to see IARC defunded and dismantled. They’ve said as much through the disingenuously named Council for Accuracy in Public Health Research (CAPHR), a nonprofit established by the American Chemistry Council a year ago with the specific goal of promoting the “reform” of IARC. The Food and Drug Administration (FDA) has resumed its first-ever endeavor to evaluate how much of a controversial chemical is making its way into the U.S. food supply. And the tests can’t come soon enough as safety concerns about the herbicide known as glyphosate grow. The FDA, the nation’s chief food safety regulator, launched what it calls a “special assignment” last year to analyze certain foods for glyphosate residues after the agency was criticized by the U.S. Government Accountability Office for failing to include glyphosate in annual testing programs that look for many less-used pesticides in foods. But the agency scuttled the testing after only a few months amid disagreement and difficulties with establishing a standard methodology to use across the agency’s multiple U.S. laboratories, according to FDA sources. Many observers suspected the suspension might be politically motivated because it came after one FDA chemist found glyphosate in several samples of U.S. honey and oatmeal products, including baby food. As well, private organizations have detected glyphosate residues in an array of food products. In April the Canadian Food Inspection Agency reported that it found glyphosate residues – mostly in small amounts – in roughly 30 percent of foods it tested. The U.S. Department of Agriculture had intended to start testing some food samples for glyphosate in April of this year, agency documents obtained through Freedom of Information Act requests show. But the agency decided to abandon that plan. Sources inside the FDA said agency glyphosate testing resumed in early June and FDA spokeswoman Megan McSeveney confirmed the news this week. Alongside the testing for glyphosate, the FDA laboratories have also said they were analyzing foods for 2,4-D and other “acid herbicides.” Chemical company players have started combining 2,4-D and the herbicide dicamba with glyphosate in new weed-killing products and use is expected to rise, so tracking residues in food is important. But the FDA has provided few details about any of the testing, and what is known has mostly been learned through internal documents obtained through Freedom of Information requests. Glyphosate is the most widely used herbicide in the world, and is the key ingredient in Monsanto Co.’s branded Roundup herbicides. It has been classified as a probable human carcinogen by the World Health Organization’s International Agency for Research on Cancer (IARC), which said that years of research on the chemical shows evidence of genotoxicity and oxidative stress from glyphosate, including findings of DNA damage in the peripheral blood of exposed humans. But U.S. and other many other regulatory bodies have said there is not sufficient evidence to support that view. The concerns about glyphosate have sparked debates across the United States. On Wednesday, California environmental health regulators were holding a public hearingregarding their plans to add glyphosate to a list of chemicals known to cause cancer, a move Monsanto is protesting. There was also news on Wednesday that the Environmental Protection Agency’s (EPA), Office of Inspector General is initiating a probe into possible collusion between Monsanto and a former top EPA official who provided favorable assessments of the safety of glyphosate while at the EPA. That official, Jesudoss Rowland, was deputy division director within the health effects division of the Office of Pesticide Programs. Rowland managed the work of scientists who assessed human health effects of exposures to pesticides and he chaired the EPA’s Cancer Assessment Review Committee (CARC) that contradicted the IARC finding and determined glyphosate was “not likely to be carcinogenic to humans.” Rowland left the EPA in 2016 shortly after a copy of the CARC report was leaked and cited by Monsanto as evidence that the IARC classification was flawed. Rowland had a long history of taking a favorable position on Monsanto’s glyphosate. In 1998, Rowland and the hazard identification assessment review committee ― where he served as executive secretary at the time ― recommended that the EPA drop the extra safety margin designed to protect children in the agency’s re-evaluation of what constituted a safe dose of glyphosate. Rowland and another EPA scientist authored the report making the recommendation. The decision to drop the extra safety margin called for in the Food Quality Protection Act was important in helping Monsanto gain approval for expanded tolerance levels for glyphosate residues in food. Pesticide residues are legal in food if they fall under the so-called “maximum residue levels” or MRLs set by the EPA. As the FDA tests for glyphosate residues in food the agency specifically will be looking to see if residues they do find fall within those MRLs. Over the years, the legal limits for glyphosate in food have risen multiple times as glyphosate use has risen. The Canadian Food Inspection Agency has gone where the U.S. government dares not tread – testing thousands of foods commonly consumed by its citizens for residues of a controversial herbicide linked to cancer. And the findings are less than appetizing. The agency said it found the pesticide known as glyphosate, the key ingredient in Monsanto Co.’s Roundup branded herbicides and other products, in 29.7 percent of 3,188 foods tested in 2015 and 2016. Glyphosate was found in 47.4 percent of beans, peas and lentil products; 36.6 percent of grain products; and 31 percent of baby cereals, the agency report states. 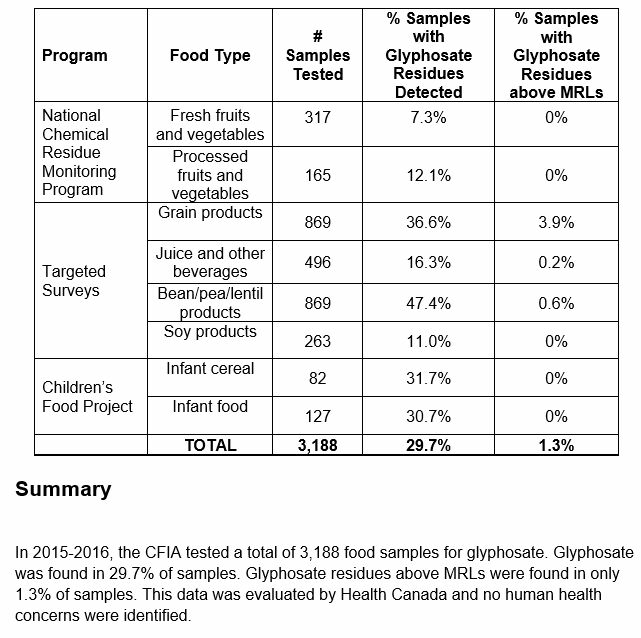 Only 1.3 percent of the total samples were found with glyphosate residue levels above what Canadian regulators allow, though 3.9 percent of grain products contained more of the weed killer than is permissible. These legally allowable levels are referred to as Maximum Residue Limits (MRLs), and they vary from food to food and pesticide to pesticide, as well as from country to country. Regulators and agrichemical industry interests say as long as residue levels are lower than the established MRLs, consuming the pesticide residues is not harmful to humans. But a growing number of scientists and medical professionals say such claims are false, particularly with pesticides like glyphosate, which is the most widely used agrichemical on the planet, commonly used in the production of dozens of food crops. Glyphosate is sprayed directly onto crops like corn, soybeans, sugar beets and canola, all of which are genetically engineered to tolerate the pesticide. Monsanto has also encouraged farmers to spray the chemical directly on oats, wheat, peas and lentils shortly before harvest to help dry them out. The World Health Organization’s International Agency for Research on Cancer classified glyphosate as a probable human carcinogen in 2015 and said years of research on the chemical shows strong evidence of genotoxicity and oxidative stress from glyphosate, including findings of DNA damage in the peripheral blood of exposed humans. Many regulatory bodies, including the U.S. Environmental Protection Agency, have determined glyphosate is not carcinogenic, but the issue is the subject of much controversy. Internal Monsanto documents revealed through litigation in California indicate that the company may have ghost-written studies attesting to the safety of the chemical that were relied on by regulators. They also show the company discussing an EPA official that may help “kill” a cancer study of glyphosate. A source within the FDA said there has been political pressure not to delve too deeply into the issue of glyphosate residues. But both the USDA and FDA have said their reasons for not testing have nothing to do with outside influence and are purely based on the fact that glyphosate is more difficult and expensive to test for than other pesticides, and the fact that it is considered safe. The FDA has said it is working on resuming its limited testing of corn, soy, eggs and milk for glyphosate residues. “I’m not sure what is going on, but it doesn’t smell good,” said Blumberg, who has been active in lobbying Irvine school districts and city leaders to reduce their use of glyphosate and other pesticides in public areas.